Significance : Saint Alphonsa's Tomb is situated in the St. Mary's church here. Bharananganam known as Lisieux of India after the birthplace of St. Theresa of Lisieux in France, is located on the banks of Meenachil river, 5 km east of Pala in Kottayam district in the state of Kerala. The thousand year old St. Mary's Church here is one of the famous pilgrim centers of the Christians in Kerala. Also known as Anakkallu Palli, it is the place holding the mortal remains of St.Alphonsa (1910-1946). The death anniversary of Saint Alphonsa, which falls on the 28th July is an important day for the devotees. Every year on this day, thousands of devotees visit this holy shrine and the Mortuary Chapel, next to the church where the mortal remains of the saint is preserved, to pray and seek her blessings. Saint Alphonsa was born on 19th August 1910 at Kudamaloor, a rural village near Kottayam in Kerala state. Sister Alphonsa, was the fourth child of Joseph and Mary Muttathupadathu. Nicknamed as Annakutty, Alphonsa's mother died when she was very young and she was raised by her maternal aunt, Annamma Muricken of the erstwhile Muricken family at Muttuchira and her great-uncle Rev. Fr. Joseph Muttathupadathu. As a child, little Alphonsa was inspired by St Theresa of Lisieux and she wanted to dedicate her life to Christ. At 13 of years of age, she burned her foot in an ash pit to escape from a marriage proposal. Against such determined resistance, her aunt Who brought her up with strict discipline, allowed her to join a convent. She then joined Franciscan Clarist convent at Bharananganam in 1927 taking the name Alphonsa, and received her postulant's veil on 2nd August 1928. Sr. Alphonsa spent 20 years of her life there. She also taught one year at a School in Vakakkad. All through her life, Alphonsa suffered from health problems, and after years of illness and great suffering she died on 28th July 1946. She was buried at Bharananganam in Palai diocese. Saint Alphonsa lived a saintly life and was recognized as a saintly person during her lifetime. Even at a young age she showed a great zeal for suffering and she used to pray fervently and longed for sacrifice and fasting as and when possible. She believed that she must endure all things that tests her will and offer them to the Lord. It is said that in spite of her painful diseases, she was cheerful to the last. It was her students who established the cult of Saint Alphonsa. After her death, they began visiting her tomb and offering prayers. As they continued, they started receiving favours. Ever since, her tomb has been a centre of pilgrimage and innumerable miracles. The first officially confirmed miracle was that of Jithin, a disabled child who was miraculously cured of his ailment and his limbs restored, due to prayers at the altar of Sister Alphonsa's shrine. The miracle was approved in 1985. The diocesan process of her beatification started on December 2, 1953 under the leadership of Cardinal Tisserant. Her beatification( recognition by the Church of a dead person's accession to heaven) was blessed by Pope John Paul II,during his visit to Kerala in 1986. On June 1, 2007 Pope Benedict XVI authorised her canonization. And Sister Alphonsa became Saint Alphonsa after she was canonised by Pope Benedict XVI at a ceremony at St. Peter's Square, Vatican on October 12, 2008. Saint Alphonsa is the first person to be conferred sainthood from the Kerala Church, which traces its origins to the visit of St Thomas around 2,000 years ago to preach the gospel in India, and the second Indian to get that status after St Gonsalo Garcia. The Clarist convent where Sr. Alphonsa lived is located near St. Mary's Forane Church in Bharananganam and to the north of the convent is the Mortuary Chapel inside which the Tomb of Saint Alphonsa is placed. There is a museum adjacent to the chapel where her personal belongings such as books, umbrella, cot etc. is well preserved. It has a copy of the sermon of Alphonsa’s funeral which reads: "Alphonsa is among the few great souls who lived in India; who have achieved greatness in God’s sight". Adjacent to this, is her room where she spent many years. 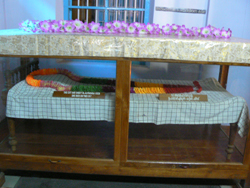 The cot which she used during her illness is considered most sacred. There is a two floored structure in front of the chapel which was originally the Papal podium for the beatification ceremony on 8th Feb.1986. History points out that the village Bharananganam has had very important visitors like St. Thomas, the founder of Christianity in the country, social reformer Sree Narayana Guru and Mother Theresa, to name a few. Now there are churches and shrines carrying the name of Saint Alphonsa across Kerala and in other states, and in the United States, of the parishes of 1,00,000 immigrant Syro-Malabar Catholics, two parishes have already been named after Saint Alphonsa.